Lake Effect's Audrey Nowakowski with author David Howell. It takes a special relationship with biking - and yourself - to embark on a solo bike tour from Seattle, Washington all the way to Milwaukee. 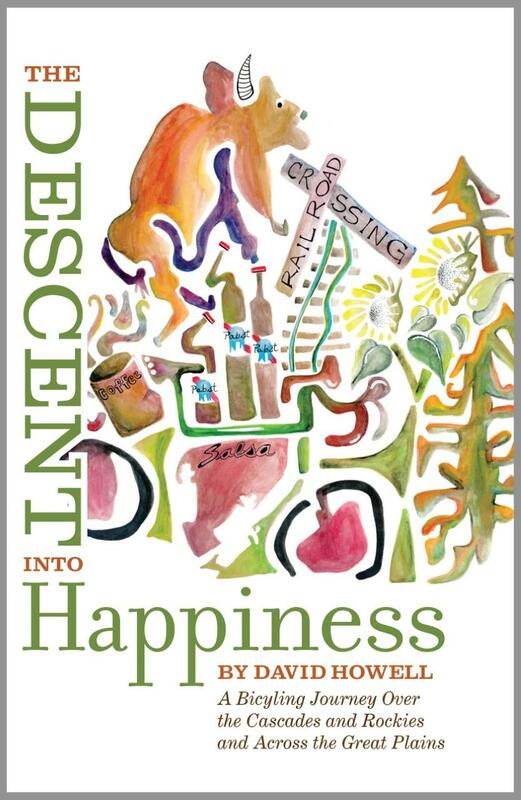 That’s exactly what Milwaukee native David Howell did, and his journaling during that experience spawned a book, The Descent Into Happiness: A Bicycling Journey over the Cascades and Rockies and across the Great Plains. "I've been riding a bike my whole life and one of the things I love about bicycling is there are so many different ways you can experience that medium," says Howell. Having trained for and completed many sporting events, such as Iron Man competitions, he says he was looking for a new challenge. That answer came to him when he came across a touring bike in a local bike shop. For a month, Howell loaded up his bike with fifty pounds of gear and rode his bike for up to 100 miles a day. His self-supported ride took him over the Cascades, through Glacier National Park and across the Great Plains. After a lot of research, mapping routes and getting the proper supplies, Howell set out not just to physically complete the trek, but to document it in a daily journal. As a professor in the Humanities Department at the Milwaukee School of Engineering, it was only natural for him to want connect his experience on the bike with the "non-thought" state of mind that comes with along it. "I always wondered, 'What are these people thinking about when they’re out there for long stretches of time?' Cause there’s a lot of information in these narratives about the details of the ride, but I just thought, wow, what does this do to someone’s head? And that’s where I really wanted to go," Howell explains. Being an introvert, he also wanted to feed his natural need for solitude, while still staying connected to his wife, family and the people he encounters everyday. "I love problem solving, and I believe that the larger the problem you have to solve, the more space you need to solve it," he says. "And at the time, I had a problem of scale." Howell admits that one's first bike tour is a challenge nobody can completely prepare for. Although he did ride his bike as much as possible in Milwaukee, his body learned to adjust to spending long stretches of time in the saddle - after a few road bumps. Howell notes there were a few times he needed to stop on the side of the road and refuel with lots of water and the occasional entire jar of peanut butter. "The first week was a challenge, in large part because there was so much to learn," he says. "When you're taking in the experience that you don't fully understand, everything is a variable." For a month, Howell rode across the United States - learning about himself, fellow bikers, how the landscapes reflects the people that called them home and how to truly enjoy the moment. "One of my big takeaways was how can I take what I learned from this trip in terms of spending quality time alone, slowing my thought process down, how can I re-purpose these things in my day to day life back in Milwaukee?" he asks. Lake Effect's Audrey Nowakowski with David Howell (part 2). For Howell, this trip was the first of many more tours to come. 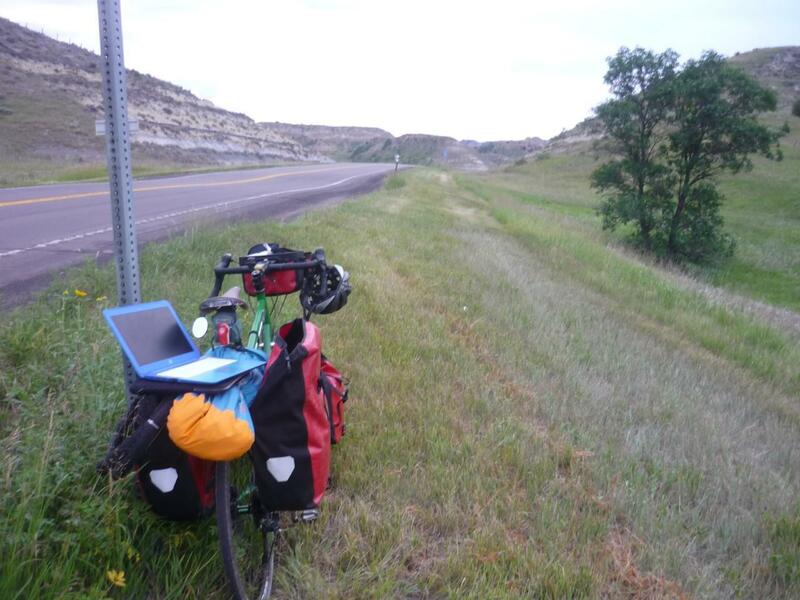 Riding across the country and meeting fellow cyclists of all ages dissuaded any fears of bike touring as a sustainable hobby. "One thing that I learned is that the more years you do this kind of activity, the more likely you can continue to do it," he says. For Howell and the other cyclists he met on the road, touring across the country is nothing miraculous or as impressive as it may seem to an outsider. Instead, it’s “heightened state of normal” that increases the quality of human interactions – particularly on the Great Plains. Having started the trip in Seattle as an introvert trying to balance his need to be alone with the challenges of everyday life, Howell found that the biking, writing and socializing changed his outlook. The Northern Tier Diet worked: Howell lost about 25 pounds over the trip and had intended to maintain his lighter weight upon his return. However, he “failed miserably” at limiting his diet since “(he loves) to have a beer at the end of the day and eat good food.” Howell plans to try again to drop weight on another bike ride and not make the same mistake. But ultimately, he says weight loss was not the key goal to accomplish on his first solo journey. I need to exercise my humanity more consistently: “When you’re out there and you are consistently running into people who are willing to invite you into their home, or share a meal, or just have a conversation with you…When that happens 32 days in a row, it’s got to leave a mark,” Howell says. “And if you ignore that information, I think it’s to your detriment. So it made me believe in humanity once again." David Howell will be hosting a discussion on “The Mindful Cyclist” at the Urban Ecology Center Tuesday evening. Many people set New Year’s resolutions regarding weight loss, exercise and health. From Atkins to Paleo to cleanses, there is never a shortage of diet fads and trends. Yet, every January people make the same resolution - over and over again. If you enjoy blaring your music while you workout but have yet to step into a group class session, there may just be a new fitness format for you. POUND utilizes elements of music and drumming into a full-body workout that combines cardio, conditioning and strength training with low impact movements. Created by recreational drummers and former athletes, this new format has grown from its first class in a Los Angeles basement into a global network. Just because the weather is getting colder, doesn’t mean you can't keep cycling. Whether you’re facing the cold or in a room on a stationary bike, cycling is an effective cardiovascular workout for any time of year. If you’re not into facing the cold and don’t just want to ride the stationary bike, most gyms and fitness centers offer cycling, or spinning class. Plenty of people like nothing more than experiencing nature. Shorewood native and author Pete Fromm realized he was one of those people. Fromm's, who lives in Montana, love for nature has resulted in five Pacific Northwest Booksellers Awards. He says his parents planted that seed - perhaps unknowingly - through family camping trips.